Original article appears in GuideStar October, 2011. “Bob” is a lifelong avid amateur astronomer as well as an artist and a photographer. He became interested in astronomy in the 4th grade at age 10. Bob soon bought a 2.5-inch refractor in 1951 which he used for ten years. His next purchase was an 8-inch reflector, followed by a Cave 12.5 reflector. In the 1980s Coulter Optics offered a 17.5 Dobsonian telescope and he was one of the first to buy one. He now observes with a 22-inch Dobsonian truss tube reflector fitted with servo motors. By the time he was 15 he started doing drawings and oil paintings. In high school he was the yearbook sports photographer. However, a tour of duty in the Army and earning a living held back all three hobbies until after he retired in 1996. Bob worked as a precision roll grinder and lathe operator for 37 years at Allegheny-Ludlum Steel Corp. Now that he is retired, Bob is very active in all three hobbies. Bob has coauthored, along with Glen Sanner, a three volume set of astronomy books titled The Night Sky Observer’s Guide. Due to his artistic abilities the publisher accepted his page layout without any major revisions for all three volumes. The “Guide” shows people who have telescopes what to look for in the night sky describing objects such as double stars, star clusters, nebulae, and galaxies with a range of different size telescopes. In 2003, after living in Pennsylvania all his life, Bob and his wife moved to Arizona (Glen had moved there first in 1987). The clear, dark night skies of the southwest offered much more time for him to pursue his astronomy interests. It wasn’t long until he joined the Huachuca Astronomy club and two local art clubs in southeastern Arizona where his paintings are on display in their galleries. I am an avid amateur astronomer. In addition I enjoy nature photography and woodworking. I had an interest in astronomy in high school but did not pursue it until 1975 when I purchased my first telescope, a Celestron 5 inch SCT. At that time I began attending the meetings of our local astronomy group, the Kiskiminetas Astronomy Club. George Robert Kepple better known as "Bob," was a member and an officer of the club. Bob lived near my home and he invited me to observe with him at his backyard observatory utilizing his 12.5" Cave. In the early 1980's "aperture fever," struck and I built an 18.5" Dobsonian. The homebuilt backyard domed observatory came next. This hobby was getting serious. With the advent of home computers and desktop publishing software, Bob and I decided that we could publish a bi-monthly astronomy observing magazine. We called it the Observer's Guide. We described, with the help of our readers, objects in the night sky which would interest amateur astronomers. We continued the magazine for six years. Then Perry Remaklus of Willmann-Bell publishing approached us to do a book loosely based on our previous work. 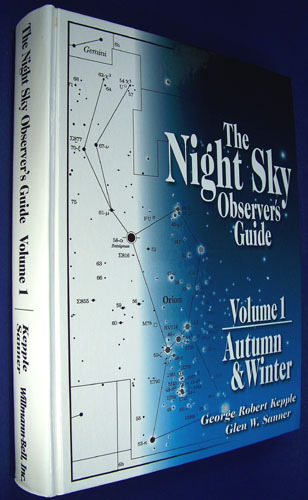 With guidelines set up by our publisher it took us several years to co-author The Night Sky Observer's Guide, Volumes 1 & 2. In 1997, after working for thirty years as a pharmacist in western Pennsylvania, I had an opportunity to make a job change. That change led me to southeastern Arizona. What a change in skies! My wife Deanna and I moved into our Santa Fe style home in 2000 and shortly thereafter the backyard observatory was finished. It now houses my original 5" scope, the 18.5" and a 12.5." I am an active member of the Huachuca Astronomy Club and I have a great interest in observing "faint fuzzies," pushing my scopes to their limits. Since retiring in 2008 I have also actively pursued nature photography, specifically birds in flight. With the advent of DSLRs a whole new world of photography is possible. I have joined a local art association and display my work in their gallery. My long-time woodworking hobby allows me to mat and custom frame my own work. Woodworking provides another avenue of enjoyment when not observing the night sky. What a great time to be involved with so many wonderful hobbies! Clayton: Great to have you guys here for a long overdue interview. Your set of three observing guide books are just what the amateur astronomer needed. I bet it was real work for both of you… I see thousands of man-hours involved here. Are there any afterthoughts about what you might have changed in the text, layout, or photos? George: Our first draft was the magazine series so when we reworked it for the books we included all our new ideas, so there is nothing more that we would like to do. Glen: Thinking back on our work on the Night Sky Observer's Guide we did the best we could at the time. We had virtually no internet help because the "net," was so new. Now the resources available are very numerous and that perhaps would have contributed some changes, but I think we would not change very much. Clayton: You mentioned earlier that you owned a Cave 12.5” reflector. I bet that scope had awesome optics. Tell us a little about that instrument. Do you still own it? George: The 12.5 Cave was a great telescope and I would have kept it longer had the “Dobsonian Revolution” not come about.I sold it to buy the 22-inch. Clayton: How are the sales of your books? Are they catching on? George: Actually, the books are tapering off because by now most serious observer’s have a copy. They really sold quite well the first two years. Glen: I can assure you, Clayton, that they have caught on.We continue to sell the books to those who are just entering the hobby, and we also sell many to seasoned observers looking for new objects or wanting to find photographic targets. Clayton: How often do you guys actually observe together? George: We observe together quite often, one night I go up to Glen’s observatory, the next night he comes down to mine. Glen: We often observe together because we enjoy sharing the night time sky and one of us always has something different to contribute to our observing session.In addition we often have others viewing with us.I have found it more fun to be with friends rather than observing alone. Clayton: Tell me about your home observatory. It sounds great. George: My observatory is a 18x24 foot building with a roof that rolls off to the north. When it is open the roof is over my computer/warm-up room which keeps wind gusts from getting under it. The part that houses the telescopes is 18x18. Glen: I have a 17' x 22' roll off roof observatory with a warm up room attached which also houses the computer area. Clayton: How are we ever going to get our children more involved in astronomy? George: That’s a question Glen and I have talked about often. With all the interactive computer games, etc. you would think it is an impossible task. When we have public star parties, I get kids going “Oh, Wow,” especially when I show them Saturn, or a globular cluster so I know they are impressed. Glen: I think outreach is the only answer.Children are a lot more involved with activities today than they were a generation ago and it is our responsibility to promote astronomy any way we can.Inviting parents to bring their children to star parties or public events related to astronomy is good way to foster the hobby.teachers involved and helping them with resources is also important. Clayton: We all have a funny story to tell about observing under dark skies. Perhaps something that could go wrong… did go wrong! Have you got a tale to tell? George: One night back in Pennsylvania Glen and I got trapped in my observatory by a Skunk that refused to go away. Glen: We were observing in my backyard domed observatory in Pennsylvania for a couple of hours and we decided to step outside for a minute. We found that the most beautiful "aurora borealis," was taking place and that we had missed it for those couple of hours because of the dome. Clayton: Do you have an amateur observing mentor? Glen: I would say that George is my mentor.He was observing long before I got "the bug," and he is a wonderful teacher.I am trying to be a mentor to young people just getting into the hobby. George: Once a person buys a telescope I like to show them how to use it and later encourage them to do some of the Astronomical League observing programs. The League gives you a pin and a certificate for observing a list (usually a hundred objects). This is a good way of becoming familiar with the sky. You can work toward a master observer’s certificate by doing ten programs, five required programs and five of your own choosing. Through the years I have finished 22 programs and am working on two more. Clayton: How many star parties do you attend per year? Which ones? George: Not counting our local club star parties, I average four or five. I like the Texas Star Party and the Okie-Tex star party the best. Glen: I usually attend TSP and the Okie-Tex star parties as well as Riverside if possible.In addition, I go to as many local star parties as I can. Clayton: How do you envision amateur astronomy in the next 25 years? Glen: I envision less visual astronomy.We are becoming more tech-savvy and that will lead to less visual "out under the stars" astronomy and more "armchair," astronomy.We now have amateurs running remotely controlled telescopes doing all sorts of astrophotography, astrometry, and spectroscopy.The new photographic astronomy surveys which will continue to come "on-line" will lead to many other avenues which we cannot even imagine. Clayton: Do you have any helpful advice to pass on to observers just starting out in astronomy? George: I certainly do. I always get asked what kind of a telescope to buy which will allow astrophotography. I advise them to get a telescope and learn to use it and get familiar with the sky first.If they keep insisting that they want to take astrophotos,I advise getting an SCT with a wedge or a German equatorial mount. Glen: Learn the sky!I encourage those just getting into the hobby to get out under the stars and become familiar with the heavens above. Learn those constellations and then you can go "deep." Clayton: Is there an e-mail address that you have that a Houston Astronomical Society member could contact you for an additional question or two? Clayton: Thanks for both of you guys taking the time to share your interest and thoughts within our HAS newsletter, ‘The Guide Star’. We wish you luck with all of your astronomy interests. Please come visit our society when in the Houston area, we’d love to see you. Clear skies always! Glen: It has been a pleasure, Clayton.Please come and visit us in southeastern Arizona. George: Thanks Clayton, it was nice meeting you at TSP. I’ll reinforce Glen’s invitation, if anyone is in our area of Arizona, let us know you will be in the area and stop by for some observing. Membership has benefits! Learn more about joining HAS. HAS Store is now online! Visit our store to order HAS shirts and other goodies! HAS has begun using RainedOut, a text message service, to communicate late-breaking news about events. Click here to learn more and subscribe!